If you’re wondering what an escape room is, you’re not alone! It is an emerging genre of entertainment, the core of which revolves around a passion for exercising all faculties of the mind. Using only the resources and clues at hand, paired with the collective brainpower of your team, you are tasked with solving a series of unique puzzles that aid in your escape. Cleverly navigate our themed escape rooms to prove your wits, without the aid of an electronic device. Are you up to the challenge? Incorporate Conundrum into your next event or party with our themed mobile escape rooms. Book our 10’x10’ escape room tent and we’ll set up an immersive experience for you on-site! One of our talented staff members will help facilitate throughout the reservation. If you want to bring the conundrum home, or are looking for an engaging gift to give, look no further than our retail shop. We offer a range of problem solving games, challenge boxes, board games, tinker toys, stash boxes, and much more. Exercise your mind and challenge friends or family to do the same! The key to cohesion for any corporate team is to learn how each other's strengths come together. 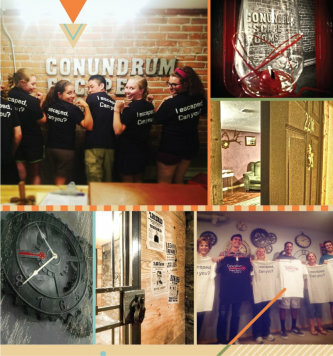 Conundrum Escape Rooms offers a unique opportunity to facilitate team building and growth in a fun, safe, and entertaining setting. Whether you’ve got a fresh crew or a well-established lineup, you are sure to find value in the experience.